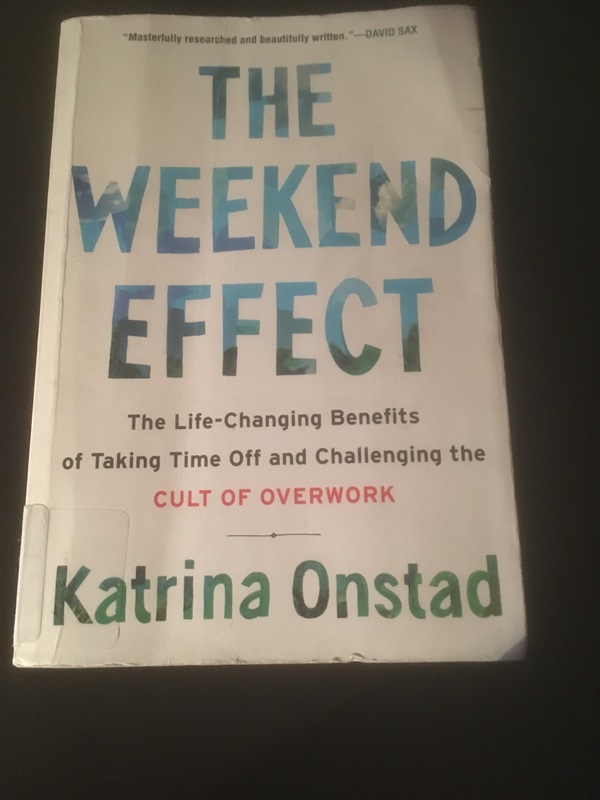 Ironically, I read the first two chapters of Katrina Onstad’s The Weekend Effect: The Life-Changing Benefits of Taking Time Off and Challenging the Cult of Overwork over short periods crammed into an especially busy month. I read about the results of her research addressing the question “What is a weekend?” on weekends with limited personal time. Then I rushed through a chapter outlining both how workers have gained and more recently lost this leisure time on weekends during time I had borrowed from other tasks and commitments. I was, in effect, a real life example of the overcommitted professional whose weekends are often spent working that Onstad describes. I would not be the only person I know to see themselves in her descriptions. One of the main concerns Onstad raises is that many of us willingly give up our weekends to work. I read the last few chapters in very different circumstances. Last week, I took five days to go on a writing retreat. Located in Northern Ontario, mostly out of cell phone range, and with limited internet, I was forced into a situation with only limited capacity to work online. With large blocks of time to read and write, Onstad’s message became clear. Our minds and bodies need time away from routine and from work. As both my mind and body slowed down, my concentration improved and this well-written, well-researched book became a road map for me to a different kind of weekend, a weekend filled with renewing relationships, enjoying nature and appreciating the beauty around me. Onstad’s book contains that essential element of a good creative nonfiction book: exhaustive notes on the research she completed. These are detailed enough that the reader can find her sources and their own work. From all this detail, anyone can realize the dream of having resting, relaxing weekends – weekends free from work and other travails. I completed the book in a setting embedded in nature, on days devoted to art and I am now committed to making better use of my leisure time.